How easy it is to forget! On creating a view with a literal (alphanumeric) value, Oracle will use the CHAR datatype. This is no problem, since the value is a constant. But what if we mix the datatypes? This entry was posted in Blog, eBS, Internals, Oracle, Troubleshooting and tagged cast, char, datatype, union, varchar2, view on September 13, 2017 by Arian Stijf. 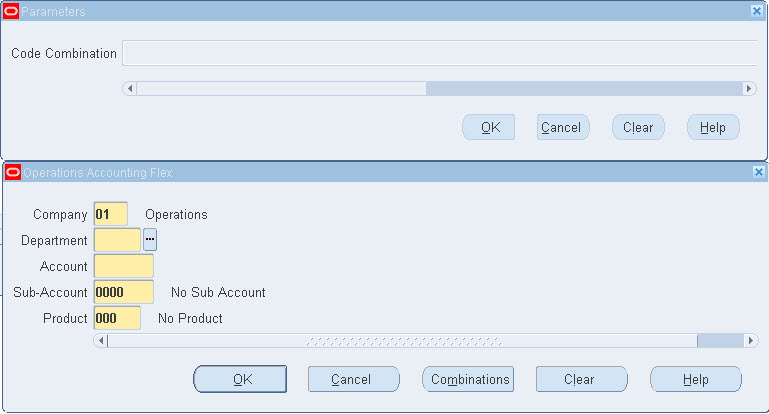 To access eBS functionality through SQL clients or PL/SQL, it can be necessary to initialize an eBS session. For example when you need to reference eBS views, access API’s or start concurrent requests from outside eBS. USER_ID -> This is the FND_USER.USER_ID for which is a session is initialized. RESP_ID -> The FND_RESPONSIBILITY.RESPONSIBILITY_ID that will be used in this session. 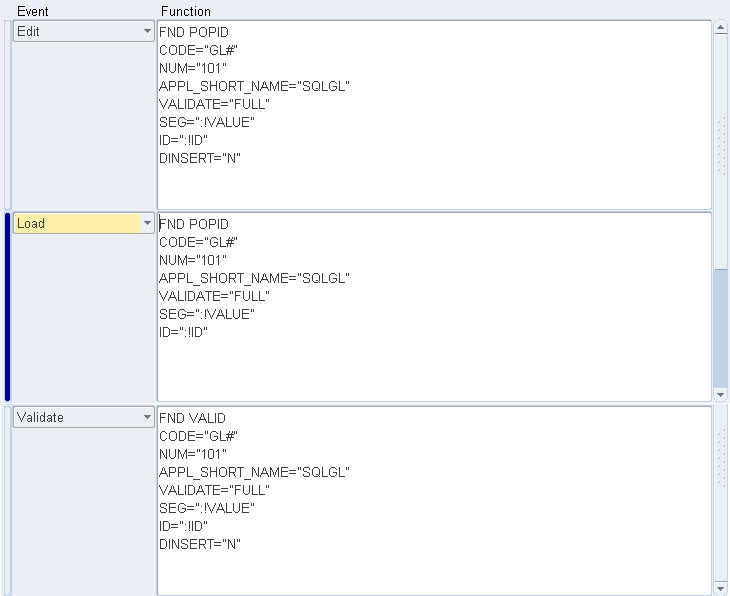 RESP_APPL_ID -> The FND_RESPONSIBILITY.APPLICATION_ID for the RESPONSIBILITY_ID. The SERVER_ID will mostly be used in case of a DMZ or server dependent services. The APPS_INITIALIZE procedure will accept any numeric value for the parameters. But the session will only be initialized successfully with at least a valid USER_ID. 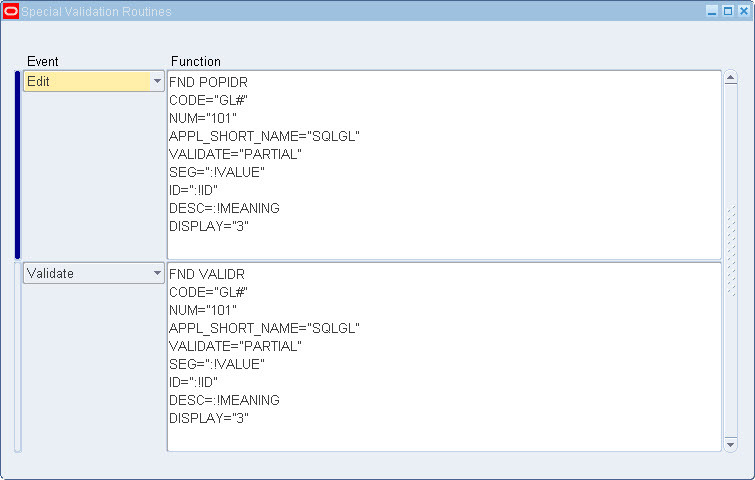 – Set up a PL/SQL table in FND_GLOBAL with some session variables. 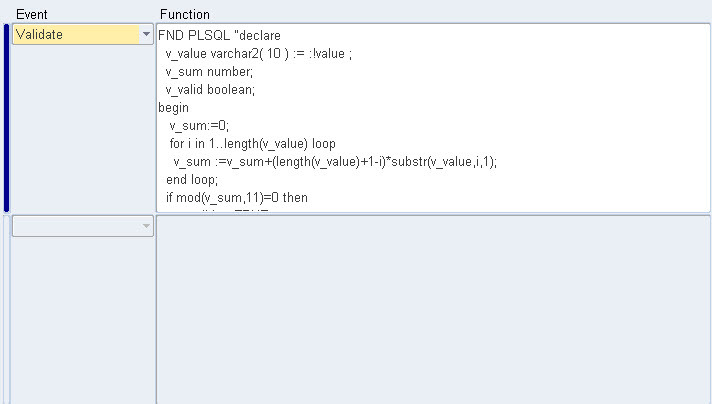 These variables are accessible through functions in FND_GLOBAL. 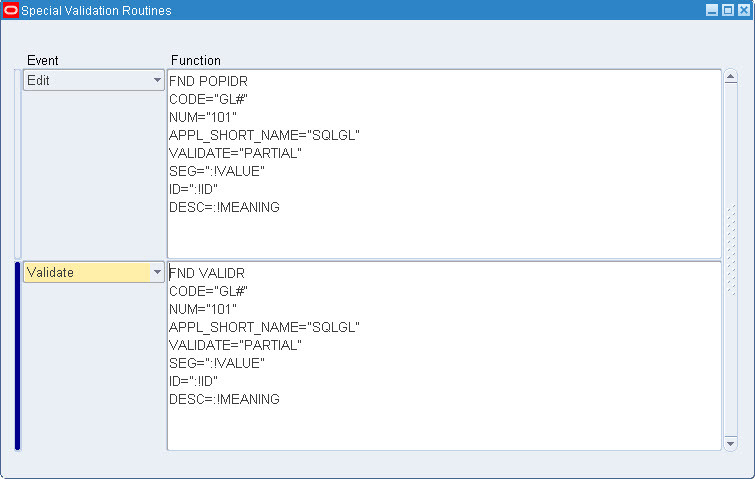 – Set up a sys_context (‘FND’) with the same variables. – Set the organization context. – Set up the Security Profile in case of HR Security. I will document the details of the HR Security later and skip the details in this article. – Set the Consumer Resource Group. – Execute product specific initialization routines. – Execute the Custom SQL Initialization routine. 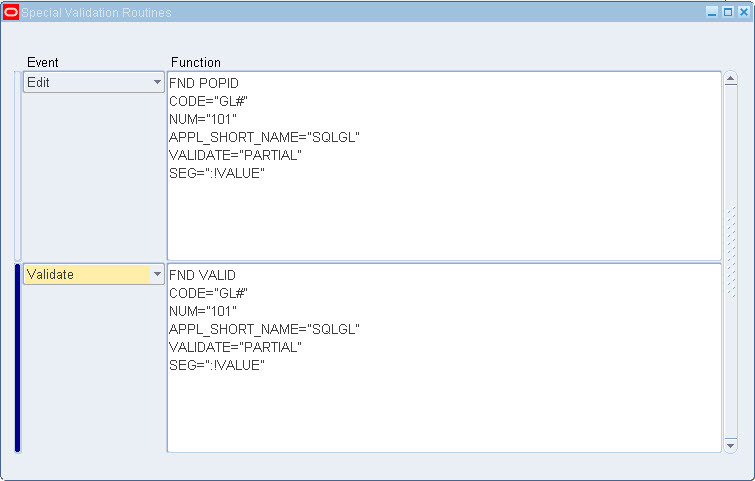 In the FND_GLOBAL package body a PL/SQL table is set up to hold session variables. Not all available variables will be set through APPS_INITIALIZE (e.g. CONC_REQUEST_ID that is only set on submitting a concurrent request). And not all variables are available (e.g. CUSTOMER_ID which is derived from the customer field in FND_USER). Undefined variables are set to -1 for NUMBER values and to NULL for VARCHAR values. There will however be NO noticeable performance difference between the two. So I advise you to use FND_GLOBAL as it is the documented solution. The algorithm to derive the Organization Context is as follows. For pre-R12 environments: Use profile option ‘MO: Operating Unit’ (ORG_ID). For R12 and beyond, the MOAC structure can be used. First check if profile option ‘MO: Security Profile’ (XLA_MO_SECURITY_PROFILE_LEVEL) is set. If this profile is set, check profile option ‘MO: Default Operating Unit’ (DEFAULT_ORG_ID). If DEFAULT_ORG_ID is not set, the ORG_ID will not be initialized. If XLA_MO_SECURITY_PROFILE_LEVEL is not set, profile option ‘MO: Operating Unit’ (ORG_ID) is used. The ORG_ID and SECURITY_GROUP_ID are then stored in the sessions CLIENT_INFO. ORG_ID starts at position 1 and is limited to 10 characters. The SECURITY_GROUP_ID starts at position 55. The CLIENT_INFO is the most common check for eBS database views to verify Organization Context. 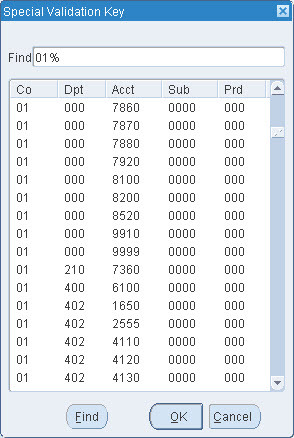 After setting the variables, the Profile Option Value cache is initialized. However APPS_INITIALIZE does not set any profile option values yet. It only sets up the required cache (which is also a PL/SQL table). Then the security context is initialized. The ORG_ID and SECURITY_GROUP_ID are set in the sessions CLIENT_INFO. ORG_ID is stored in the first 10 characters, while SECURITY_GROUP_ID is stored from the 55th position. In the profile option ‘FND: Resource Consumer Group’ (FND_RESOURCE_CONSUMER_GROUP) a Resource Consumer Group can be selected. With this setting the database Resource Manager can limit the database resources that the user can use. If this profile option is set, APPS_GLOBAL.APPS_INITIALIZE will alter the session to use the required Resource Consumer Group. Individual Oracle Products can execute their own initialization routines. The defined routines are in table FND_PRODUCT_INITIALIZATION. Each initialization can be executed based on specific conditions. These conditions are stored in FND_PRODUCT_INIT_CONDITION. The setup of these initialization routines is done through the package FND_PRODUCT_INITIALIZATION_PKG. The APPS_INITIALIZE will check the conditions and dependencies on the initialization routines and execute the routines in the required order. You may be aware that you can also set up your own Custom Initialization Routine through the profile option: ‘Initialization SQL Statement – Custom’. If this profile is set, it will also be executed through FND_GLOBAL.APPS_INITIALIZE. APPS_INITIALIZE has now finished initializing your session. Other eBS software can use the FND_GLOBAL functions, the SYS_CONTEXT or CLIENT_INFO to verify the session and security settings. This entry was posted in Blog, eBS, Internals, Oracle and tagged APPS_INITIALIZE, CLIENT_INFO, eBS, FND_GLOBAL, ORG_ID, profile, Session on September 1, 2017 by Arian Stijf. Just a short note to say that I am proud to be selected as a speaker for UKOUG Apps 2017! I will even give 2 presentations. On Monday I will present ‘Customizing Autoconfig/RapidClone’. Then on Tuesday I will present ‘Auditing the Oracle eBusiness Suite’. The first presentation is about further optimizing the Autoconfig and RapidClone processes. 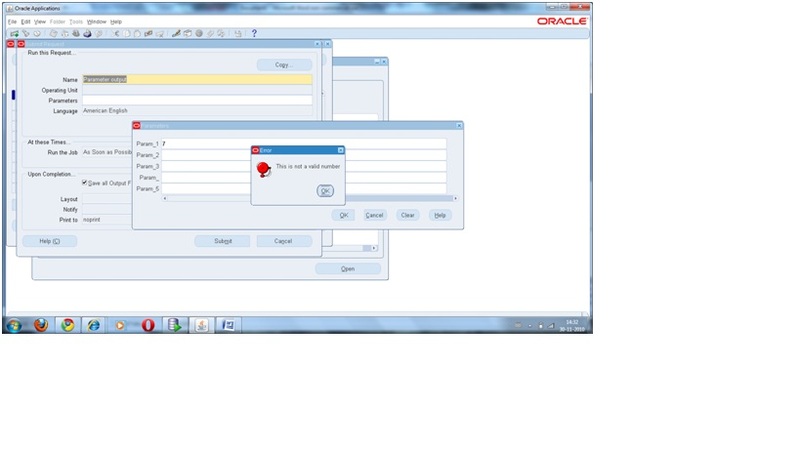 Oracle allows users to customize these processes to match their specific requirements / environments. This allows for a very flexible process. Especially since you can add your own parameters to the XML Config file. Then you can add additional templates, or customize the existing templates with (conditional) changes / additions. In this presentation, I will walk you through the whole process of customizing Autoconfig based on a fictional post-clone script that we’ll incorporate in the Autoconfig process. The second presentation is of course about Auditing eBusiness Suite. We’ll go over the different options (the eBS provided signon Audit Trail and transaction Audit Trail, database audit trail, audit vault, OS level auditing). Each auditing option has a different purpose. And you will need different options to provide a meaningful and comprehensive audit trail. One presentation is too short to build a full auditing solution. But I’ll try to give you a headstart on designing your own auditing. This entry was posted in Blog, Oracle and tagged APPS17, audit, autoconfig, clone, presentations, UKOUG on August 30, 2017 by Arian Stijf. Since I have been working a lot on NUMBER and DATE conversions lately, it’s time to write a short note about canonicals. But for Flexfields we have a controlled environment. Oracle solves problems related to conversions by storing the NUMBER and DATE format as so called ‘canonicals’. This means that all NUMBER and DATE values are stored in a fixed format. It is up tot he application to guarantee that only values in this canonical format are stored in the Flexfields. Especially for DFF values, they will often be used in customized software units. These customizations are also responsible for keeping the data in the canonical format. Best practice is to use the packages FND_NUMBER and FND_DATE. This will assure that your customizations don’t break when Oracle changes the canonical format. (e.g. change the precision on NUMBER). The FND_NUMBER package contains 2 procedures: NUMBER_TO_CANONICAL and CANONICAL_TO_NUMBER. Both take 1 parameter which is a NUMBER respectively a VARCHAR2. The NUMBER canonical format is ‘FM999999999999999999999.99999999999999999999’. Those are 21 positions left and 20 positions right of the decimal ‘.’. Both functions round the result to 20 decimal positions. For some reason FND development used a TRANSLATE statement to switch between te decimal separator fort he session and the ‘.’ used in the canonical format. (Hint: TO_NUMBER and TO_CHAR (number) accept the parameter ‘nls_numeric_characters’). The FND_DATE package contains a lot of procedures for backward compatibility. But for canonical values in Flexfields we need CANONICAL_TO_DATE and DATE_TO_CANONICAL. Since to TO_CHAR(date) and TO_DATE both accept a date mask, the procedure only contain a TO_CHAR/TO_DATE function. The canonical mask for DATE is: ‘YYYY/MM/DD HH24:MI:SS’. Two other functions that are convenient to use when dealing with string values and dates are STRING_TO_DATE and STRING_TO_CANONICAL. For dates MONTH, AM/PM and AD/BC values are language dependent. So based on the session settings they may return different results. STRING_TO_DATE and STRING_TO_CANONICAL handle this by trying different language settings. In order they try NLS_DATE_FORMAT (default), NLS_NUMERIC_LANGUAGE and the installed eBS languages from FND_LANGUAGES. Both take a string that represents a date and the date-mask for the string. STRING_TO_DATE returns a DATE value, while STRING_TO_CANONICAL uses STRING_TO_DATE but converts the result to a canonical VARCHAR2. HTH. As always, feel free to leave comments and questions. This entry was posted in Blog, eBS, Flexfields, Oracle, Validation and tagged canonical, conversion, date, fnd_date, fnd_number, format, language, number on August 25, 2017 by Arian Stijf. Also different varieties (B.C. , bc, AD, A.D.) with or without a space, with different seperators all gave the same ORA-1856: BC/B.C. or AD/A.D. required. Excuse me. That is what I just entered. What is going on here? The values for Dutch AD/BC are V.CHR/N.CHR or in lowercaps v.Chr. and n.Chr. This entry was posted in Blog, Internals, Oracle, Scripts, Troubleshooting and tagged nls_date_language, ora-1856, ora-1856 nls_date_language to_date, to_date on August 22, 2017 by Arian Stijf. The first new blog entry on the site is about ‘Datatypes’. Or more precisely about datatype (implicit) conversions. It was triggered by the too-often-seen ORA-1722 Invalid Number. But the root cause is valid for numbers as well as dates (/timestamps). In this article I will investigate some of the causes for ORA-1722 in NUMBER and DATE conversions. All errors above have the same root cause: implicit conversions. In all cases we execute operations that are not valid for the data type that we use. Oracle needs to convert the data to a different data type to execute the operation. This conversion can fail, resulting in an ORA-1722. Or it can succeed with unexpected results. Reminder: Implicit conversions are a BAD idea. They’re guaranteed to come back and bite you. The Oracle RDBMS provides a number of data types for SQL operations and a few extra for PL/SQL operations. In this article, we’ll focus on VARCHAR2, NUMBER and DATE types. Each data type is stored in a particular way in the database. The stored value is not what you see in your GUI or reporting tool. VARCHAR2 values add extra complexity because of different character sets that can be used. But let’s take a look at NUMBER values first. We inserted the values 1 and 1.314 in a NUMBER and a VARCHAR2 column. And we can see that they are stored very differently. When we query the values, they look the same (except for the alignment). But they are obviously not the same to the Oracle RDBMS. We can use a numeric operation ‘+’ on the values after we inserted them. But when we change the parameter NLS_NUMERIC_CHARACTERS, the VARCHAR2 value is not suitable for numeric operations anymore. It is now truly a string value. How is this possible? On insert / update Oracle needs to convert all data to the internal storage format. When the data is retrieved again, it needs to be converted to whatever format the client is requesting. Initially the parameter NLS_NUMERIC_CHARACTERS was set to ‘,.’. That means that we use a decimal ‘,’ (comma). On inserting a number value in the table Oracle converted the number 1.314 accordingly to 1,314. Then it inserted this in DUMMY_VC as a VARCHAR2 value and in DUMMY_NB as a NUMBER value. 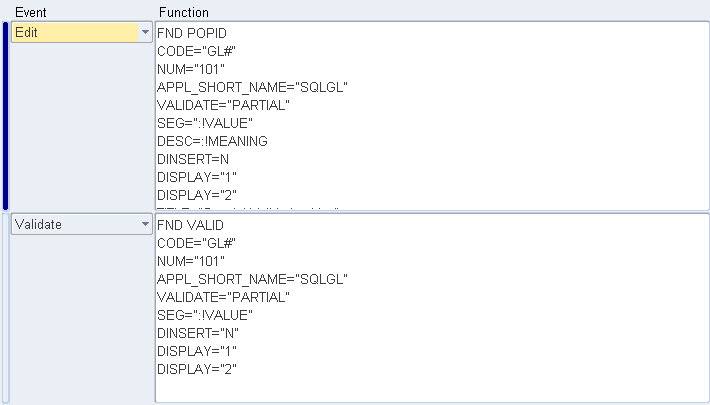 When we query the values with the same settings, Oracle does not convert DUMMY_VC. (Remember it is a VARCHAR2 value, so a text string). DUMMY_NB is a NUMBER type, so Oracle converts it to 1,314 as requested by the client. When we change NLS_NUMERIC_PARAMETERS to ‘.,’ we tell Oracle that we will be using numbers with a decimal ‘.’ (period). When we now query the values, DUMMY_VC is still unchanged (1,314) and therefore not a valid number. DUMMY_NB is duly converted to 1.314 as requested by the client. Note that NLS_NUMERIC_CHARACTERS is the most obvious parameter for this change. But all NLS parameters are interdependent. So changing NLS_TERRITORY can also implicitly change NLS_NUMERIC_CHARACTERS. In the last query, we try to execute a numeric operation ‘+’ on the DUMMY_VC value. Oracle has retrieved this value as a VARCHAR2 type. But to perform the ‘+’ it needs to be treated as a number value. But it is not a valid number, because it does not match the format with a decimal ‘.’. When Oracle tries this, it fails with ORA-1722. Now we know it makes sense. Because it is still in the VARCHAR2 format: ‘1,314’ instead of 1.314. As an exercise to the reader: How did the following happen? There is a lot going on in that demo. Let’s start with the insert statement. A VARCHAR2 or in general a string is placed in single quotes ‘ ‘. A number without quotes is just that: a number. Place a number in quotes, and it becomes a text string / VARCHAR2. A date in quotes is also just a VARCHAR2. To make a date, you need to use the to_date command. TO_DATE will convert a VARCHAR2 to a DATE. However, Oracle needs to know how to convert the date. That is what the format string is for. Without the format string, Oracle will guess the date format. And guesses can be right or wrong. To avoid errors, always use a format string. So I inserted a DATE value in a VARCHAR2 (bad idea!) and in a DATE. When I query the table, we see that the VARCHAR2 value has lost the timestamp and century. And what’s worse, it is stored as a text string with the text ’19-AUG-17’. The date value also doesn’t show the time and century. However, when we look at the dump we see that they have been stored anyway. The date is stored in 7 bytes. The century, year, hour, minute and second values have increased by 100 or 1. So we have 120 instead of 20, 117 instead of 17, 8 for August, 19 for the day. The time is stored in the last 3 bytes, each number increased by 1. So why did the VARCHAR2 loose the data on century and time. And why are they not shown for the DATE? That is because of parameter NLS_DATE_FORMAT. This is the date-format that the client will use. The default is DD-MON-RR. I created a date to insert into the VARCHAR2. Oracle converted this to the format ‘DD-MON-RR’ then inserted it into the VARCHAR2. The DATE was inserted correctly as a date. But when we query the data the DATE is again displayed in the format ‘DD-MON-RR’. To see the full date, we need to convert it into a string again with the correct format. Or we change the NLS_DATE_FORMAT to the required format. We inserted a string value that looks like a date into a VARCHAR2. When we use a date-function on it (ADD_MONTHS), it works correctly. But when we want to add 1 day to it, it returns an ORA-1722. This is caused by implicit conversion again. ADD_MONTHS does an implicit conversion to a DATE on the input parameter, then executes the function and returns a DATE. The ‘+’ operator can accept both NUMBER and DATE values. But in this case Oracle will first check if the value can be converted to a NUMBER. As we see, this fails. It might be silly to change the date-format from ‘dd-mm-yyyy’ to ‘mm-dd-yyyy’. But remember that it is the client who sets the nls_date_format. No privileges are involved in setting the format! The only way to be safe from changing NLS_DATE_FORMATS is to use DATE types for dates and proper format strings on the conversions. The VARCHAR2 string lost the century. So Oracle will just use the current century when it is converted back to a DATE again. By now I hope you have sufficient information to troubleshoot (or avoid) ORA-1722 and avoid implicit conversions entirely in your code. Feel free to leave any comments, and keep implicit conversions in mind when you encounter ORA-1722. This entry was posted in Internals, Oracle, Scripts, Troubleshooting and tagged data type, implicit conversion, ora-1722, storage, to_date, to_number on August 18, 2017 by Arian Stijf. The next part will follow shortly, and will discuss the flexfield datamodel. This entry was posted in eBS, Flexfields, Oracle, Tutorials and tagged descriptive flexfields structure segments context, eBS, Flexfields, Oracle on December 14, 2010 by Arian Stijf. It is the first part of a multi-part article. This part explains Key Flexfields in eBS. The next parts will discuss Descriptive Flexfields, the datamodel and special features. This entry was posted in eBS, Flexfields, Oracle and tagged cross-validation, descriptive flexfields, eBS, flexfield structures, Flexfields, key flexfields, Oracle, segments on December 5, 2010 by Arian Stijf. At the flexfields presentation at UKOUG, I promised an update on the PLSQL validation. Good luck on your own experiments! This entry was posted in eBS on November 30, 2010 by Arian Stijf. It's been a while since I last posted an article here. A long vacation, and testing different CMS's for the website account for the lost time. So I decided to give Joomla a try. I just finished installing the components that I want to use. And I wrote a short article, to see how it goes. I'll be transferring the articles from this website to the new one in the days to come. The article that I wrote is about adding a column to OA-Framework without using jDeveloper to change the VO. 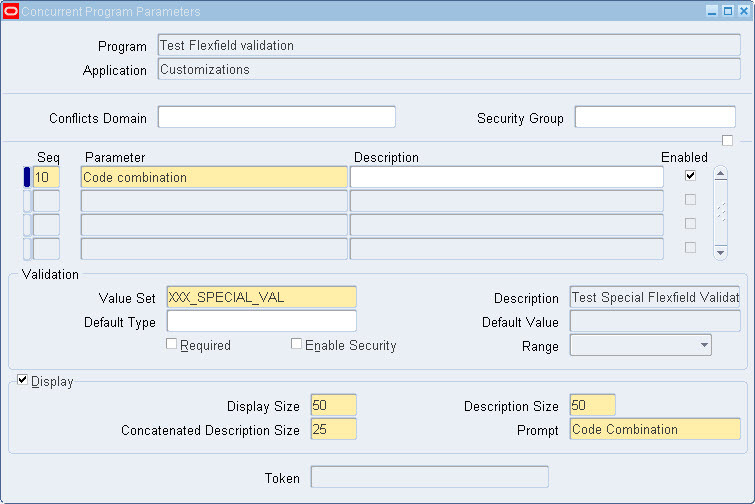 I describe how to use a descriptive flexfield to add a checkbox to the framework page. You can read the article here: here. 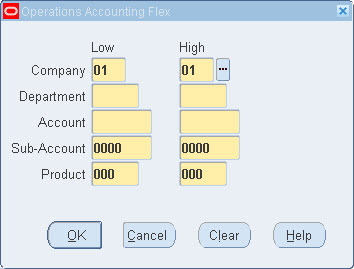 This entry was posted in eBS, Flexfields, Oracle and tagged checkbox, descriptive, eBS, flexfield, oa-framework, Oracle, personalization on June 27, 2010 by Arian Stijf.